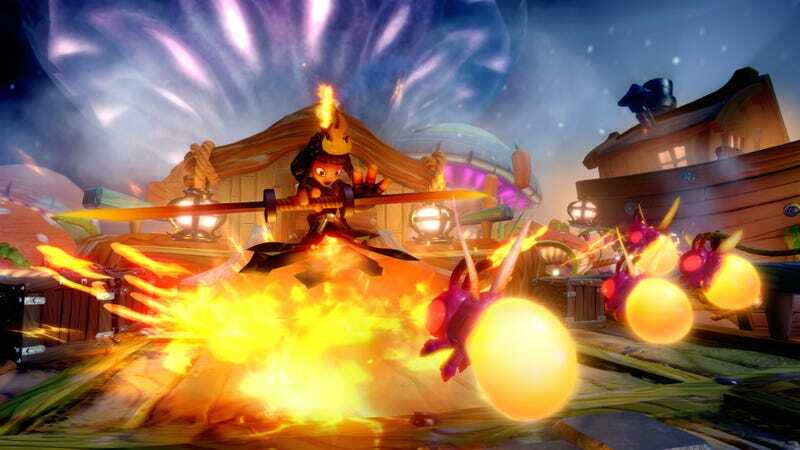 Creating a character in Skylanders Imaginators involves selecting from one of ten battle classes, and upping the level cap on those classes requires Sensei toy/characters of the same class. Ember here will lend her powers to the Sentinel class, which I can only imagine is a battle class that specializes in keeping enemies at bay.Her Sword Slash and Volcano Summon should do the trick nicely, and once the enemies are pushed back, why not drop a Meteor Strike on their heads? Let’s take a look at Ember in action. She’s definitely a firecracker, though I’m more impressed with the variety of enemies she’s taking on. It’s nice to see new enemies that are Chompy and Troll variants. It looks like Ember is going to be in the second wave of Skylanders Imaginators figures once the game launches on October 16.